Looking for a delicious and inventive side dish this Thanksgiving? NoMad's Made Nice shows you how to make this tasty Brussels sprout, bacon, wheat berry and chili dish. Heading to a friend or family member's for Thanksgiving and don't know what to bring? Made Nice has come to the rescue. The NoMad eatery has created a Brussels sprout, bacon, wheat berry and chili side that is easy enough to make at home. Check out the video above to see how it's made, and follow the instructions below to give it a try for yourself. 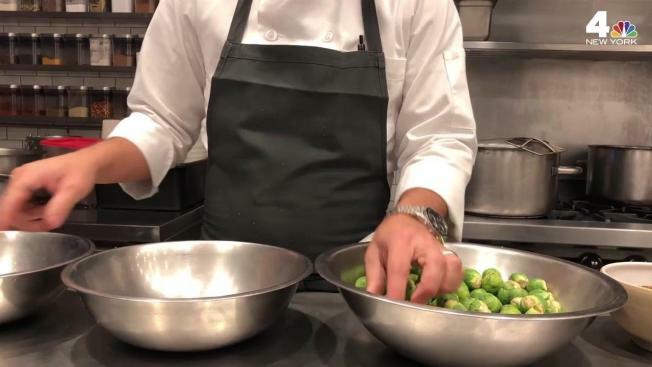 In a large mixing bowl, toss the Brussels sprouts with oil and salt. Roast the Brussels sprouts on a parchment-lined basking sheet for 15-20 minutes or until golden brown and tender. Over low heat, slowly cook the bacon in a pan until golden brown. Once browned, strain the bacon and reserve the fat. In a large mixing bowl, combine the lime juice and zest, chili paste, garlic, ginger and bacon fat. Whisk well. Toss the cooked Brussels sprouts, wheat berries and chopped parsley into the chili mixture. When ready to serve, top the dish with the cooked bacon. And if you don't feel like cooking at all, you can order your entire Thanksgiving dinner from Made Nice to pick up on Thanksgiving Day. The meal includes a whole roasted turkey with garlic, sausage stuffing, roasted autumn vegetables, potato puree, turkey gravy, green bean casserole and cranberry chutney. The meal is $250 and serves eight people. Butternut squash soup, garlic rolls, apple pie and pumpkin pie are also available a la carte. The restaurant will accept orders until Tuesday, Nov. 21 at noon on their website. Take a look at more local restaurants serving Thanksgiving meals here. ready to serve the day of Thanksgiving. Whole Roasted Turkey with Garlic, Sausage Stuffing, Roasted Autumn Vegetables, Potato Puree, Turkey Gravy, Green Bean Casserole and Cranberry Chutney for $250, serves 8 people. Butternut Squash Soup, Garlic Rolls, Apple Pie and Pumpkin Pie also available a la carte. Now accepting orders until Tuesday, November 21st at noon on madenicenyc.com.